Idiopathic pulmonary fibrosis is a life-limiting interstitial lung disease. We do not know what causes it and there is no cure. People experience debilitating symptoms and delays before a diagnosis is confirmed are not uncommon. Palliative and end of life care for these patients is of variable quality. 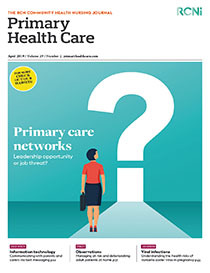 This article introduces and discusses the complexities of recognition, treatment and management of idiopathic pulmonary fibrosis, emphasising the importance of the primary care and community nurse roles. The implications for nursing practice in managing this group of people to live well and to die well will be explored.